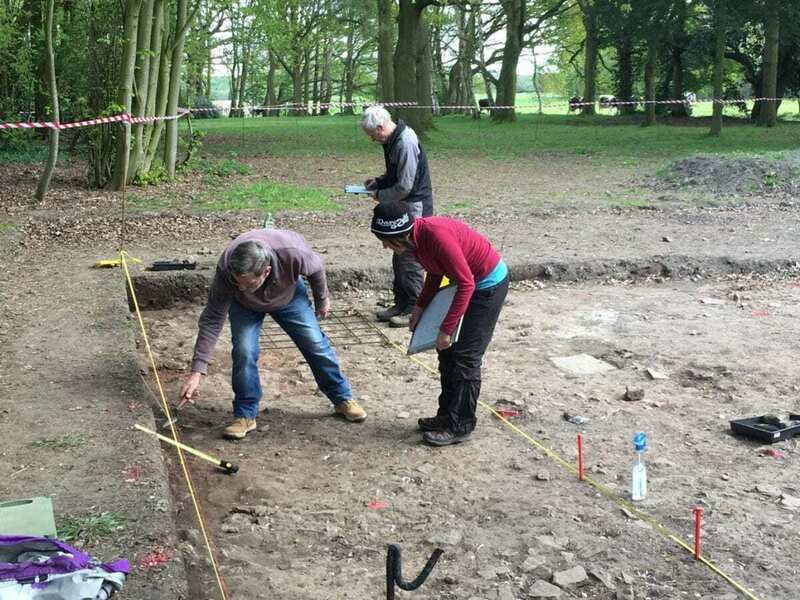 An archaeological project which is taking place on the site of a medieval castle near Ormskirk, West Lancashire, has been set up to help solve some baffling archaeological mysteries. It has long been known that the 18th century mansion designed by Giocomo Leoni and known as Lathom House, stood on the same site as its much larger predecessor, a large medieval palace fortress of the same name. However, the form of this earlier building complex has long been a mystery. 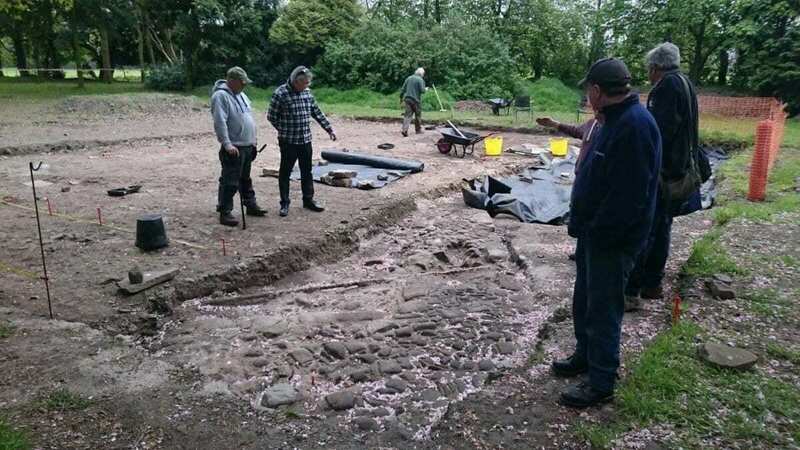 The intent of the project is to excavate part of the medieval palace fortress site at Lathom near Ormskirk, which was the home of Sir Thomas Stanley, 1st Earl of Derby and his wife Lady Margaret Beaufort who was the mother of Henry VII. Stanley is immortalised as one of the heroes in Shakespeare’s Richard III as “The King Slayer”, as well as crowning Henry Tudor king at the battle of Bosworth in !485. In addition to its Tudor links, Lathom was also the site of one of the largest and longest sieges of the English Civil war and the only battle that was commanded by a female, Lady Charlotte Stanley, Countess of Derby. Thomas Stanley, 1st Earl of Derby – Stanley was “a man of considerable acumen, and probably the most successful power broker of his age”. He was titled King of Mann, and stepfather to King Henry VII of England. A landed magnate of immense power, particularly across the northwest of England where his authority went almost unchallenged, even by the Crown, Stanley managed to remain in favour with successive kings until his death in 1504. Stanley’s first marriage was to Eleanor, daughter of Richard Neville, 5th Earl of Salisbury and sister of Richard Neville, Earl of Warwick (‘Warwick the Kingmaker’) in the late 1450s. This constituted a powerful alliance with the House of York. now occupying the English throne. Upon her death, he married his second wife Lady Margaret Beaufort, whose son, Henry Tudor, was the leading Lancastrian claimant to the throne. Stanley was the last to use the style ‘King of Mann’, his successors opting for the safer ‘Lord of Mann’. In the ‘history plays’ of William Shakespeare, Lord Stanley features in a pivotal role throughout the play Richard III as an initially loyal but troubled royal servant whose misgivings as to Richard’s ‘true’ nature lead him towards collaboration with his stepson Henry Tudor and active assistance in placing him on the throne. Richard III is believed to have been written over 1592–93. At this time, it is thought Shakespeare may already have been writing for Lord Strange’s Men, the company of Ferdinando Stanley, Lord Strange later 5th Earl of Derby. (Certainly, his actors were members of the company, and Shakespeare himself is formally listed as a member by 1594). As such, the Stanleys would effectively have been patrons of this work. This was a relationship that may have been continued as A Midsummer Night’s Dream is thought to have been possibly first performed at the wedding celebrations of William Stanley, 6th Earl of Derby in 1595. Lathom is listed in the Domesday Book. The original buildings and defences at this time may well have been wooden. The 360 acres of farmland and 720 acres of woodland, which made up the Manor of Lathom in 1066 almost certainly formed the most important of 17 manors which played a key role in a defensive system of land tenure to protect the emerging kingdom of England from the Norsemen of Dublin and York. A new castle was built in the 13th century of which no details survive and was probably replaced by the structure currently being excavated. This new structure was known as Lathom House, built in 1496, it was possibly one of the largest castles in England. It had nine towers and was surrounded by a wall two yards thick and a moat eight yards wide. Its drawbridge entrance was heavily defended by a gateway tower. In the centre of the site was a tall tower known as the Eagle Tower. However, apart from the above description we know very little as no buildings survive above ground. The reason nothing survives of this massive structure is due to the famous Civil War sieges of 1644-45. James Stanley, 7th Earl of Derby, was the leading Royalist supporter in the northwest of England when the civil war broke out in 1642. When Fairfax arrived at Lathom in February 1644, the Countess had made every effort to conceal the strength of the castle’s fortifications. Fairfax demanded that the Countess surrender Lathom to him. She asked for a week to consider his offer, and then insisted that it was only appropriate that he visit her for further negotiations. He was received as an honoured guest, but she categorically rejected his terms for surrendering. He gave her two more days to consider her situation. The emissary sent two days later was scornfully dismissed. In addition, the castle was at the lowest point in the middle of an open expanse that allowed superb views of the enemy’s activities. Charlotte had assembled a militia of seasoned marksmen who were able to inflict significant losses by sniping. During the siege, the Royalists launched several successful sorties to disrupt Parliamentary efforts to set up batteries. As a result, Parliamentary forces were unable to establish any major artillery positions against the castle, and the army refused to replenish those guns that were lost or spiked during the sorties. Morale among the Roundheads also suffered greatly as the besieged shot soldiers and engineers on the battlefield. Nevertheless, Fairfax persisted in demanding that Charlotte surrender to his forces, going so far as to obtain a letter from Lord Stanley asking for safe passage for her. She refused to surrender under any terms, rebuking messengers in increasingly disdainful tones. “The mercies of the wicked are cruel …. unless they treated with her lord, they should never take her or any of her friends alive”. The siege was lifted on the night of 27 May as the Royalist general Prince Rupert approached Lathom with thousands of cavalry and infantry. Charlotte and her household departed for the Isle of Man, leaving the care of Lathom House to Colonel Edward Rawstorne. After the Parliamentary victory at the Battle of Marston Moor, which was fought 2 July 1644, the north of England was largely under Parliamentary control apart from areas close to Royalist garrisons such as Lathom. The next year (1645), in July, 4,000 Parliamentary troops returned to begin the second siege. The garrison did not capitulate quickly, but when it became clear that no relief could be expected, and supplies were running short, famine forced Colonel Rawstorne’s hand and he surrendered at discretion to Colonel Egerton on 2 December 1645. To prevent its reuse the fortifications were totally demolished by the Parliamentarians. To assess the research potential of the site reference will be made to the research priorities within the Research Framework for North West England..
• An examination of the home of Thomas Stanley, 1st Earl of Derby “The King Slayer” one of the main heroes of Shakespeare “Richard III” and a patron of William Shakespeare. The Lathom Castle Project team will be assisted on site by military veterans from the Forces Archaeological Heritage Association. The Association gives veterans the opportunity to learn a series of skills including excavation, land survey, drawing and mapping techniques and building recording on a site of national importance. It also helps rebuild self-esteem, learn skills that will help in securing employment and helping build community cohesion. The majority of veterans taking part have injures connected with their service from places as diverse as the Falklands, Northern Ireland, Iraq and Afghanistan. The participants have suffered a broad spectrum of injuries including physical and psychological trauma. However, they will be using their skills to help the local community to acquire skills to access and investigate their local heritage. The forthcoming session of excavation at Lathom will start on 29th July and run until the 13th August and involves a total of over 20 locals and veterans.